Take a free banner or icon for your site. 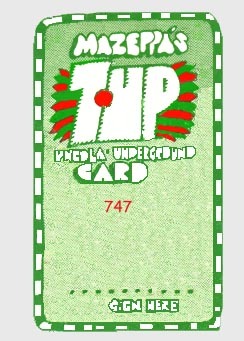 For a full page of Mazeppa-drawn Uncola cards, click here (original courtesy of Bill Groves; Photoshop touch-up by David Bagsby). Print the above page from your browser. Cut out the cards, sign, laminate, and there you are. The Uncola card is still good for a discount at any Der Wienerschnitzel in Tulsa you can find. See the Uncola man, Geoffrey Holder, in his original 1970 Uncola commercial.